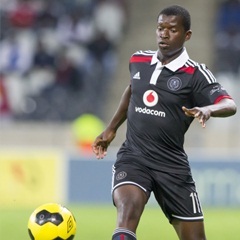 Cape Town - Orlando Pirates midfielder Sifiso Myeni is aiming to build on a man-of-the-match performance in the Soweto Derby when Chippa United come to town. The 26-year-old produced an impressive performance against Chiefs as South Africa's world-famous derby ended in a goalless stalemate. While the Buccaneers were forced to settle for a share of the spoils at the weekend, they will most certainly not be content with a draw against one of the Premiership's stragglers. Chippa are struggling near the wrong end of the table and have picked up just two points from their last four league fixtures, but managed to claim all three points the previous time these two teams met. Looking ahead to the clash, Myeni told his club's official website: "It is important for us to get the three points, we lost 1-0 to them when we played them in Port Elizabeth in the first half of the season and therefore we need to make amends. "We have started the year well and our aim is to maintain this form until the end of the season. "It is always difficult to play a match after the Derby because it takes so much out of you both physically and emotionally but we are professionals and will need to respect our opposition on Tuesday." He added: "We know they will sit back and try to play the counter, we have played against a number of teams with a similar approach and we know exactly what we need to do in order to effectively deal with them. “Obviously the tactics will have to be tweaked to tailor Chippa United but the plan will always be centered around how do we unlock them."